Unruled daily blocks for writing quick reminders. Pink highlighted QuickNotes® section on each spread for priority data. Tabs for quick access to each month. Extra ruled pages for notes and lists. MWV, the maker of AT-A-GLANCE, supports the battle against breast cancer. Since 2008 over $500,000 has been donated to City of Hope for breast cancer research, treatment and education. Pink highlighted QuickNotes section on each spread for priority data. 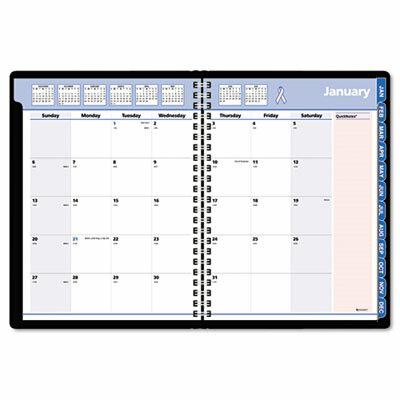 Tabbed monthly overviews for easier long-range planning. Telephone/address section keeps contact information at hand. Storage pocket for keeping loose papers. Unruled daily blocks for writing quick reminders.